Successful contract heifer growing arrangements are dependent upon effective communication, mutual benefits for the dairy farmer and the grazier, adequate health programmes and the integrity of the individuals involved. Before entering into a contract grazing relationship it is important that the expectations of both parties are understood and documented and that there is an opportunity for regular communication on issues and performance. The diagram below illustrates a process to follow when embarking a contract grazing relationship. Each of the steps are supported with appropriate resources. Use the attached questionnaire to discuss with a prospective grazier or stock owner to check alignment of expectations and discuss any issues that might arise from the grazing proposal. As well as playing a protective role, going through the contract process helps to identify and agree on the issues that are important to each party. Federated Farmers have a heifer grazing contract available for purchase on their website. DairyNZ supports the use of this contract. Work together to complete the Heifer grazing responsibilities checklist so that responsibilities of all parties (including other service providers) are agreed on at the commencement of the grazing. This does not replace the use of a grazing contract and may not be needed if a contract is used that clearly documents responsibilities. Use the Heifer grazing adverse event plan to agree on the highest risk events to your circumstances and create a plan to minimise the impact the event may have on achieving liveweight targets. Agree on planned realistic actions from both parties involved. Record all liveweights at each weighing Heifer liveweight recording sheet. Use the Heifer grazing monthly reporting template to keep up to date with livestock performance. This pdf can be filled in and emailed by the grazier, or populated by the stock owner during a phone conversation or farm visit as a monthly record of events. If expectations are not being meet by either party the Heifer grazing remedial action plan provides a process to ensure steps are taken to get stock back on track. Despite best intentions there may be times when some aspect of the stock owner/grazier relationship is not progressing as anticipated. This is often due either to a lack of clarity around expectations or poor communication. It can be hard to know where to start when having these conversations, but it is important to address problems before they escalate to a point where heifers are adversely affected or the relationship breaks down completely. Spending some time identifying the problem, gathering facts and planning your approach will help to ensure that the matter is resolved in a positive way. Click here to go through the 4 step process - Resolving Problems. Click on the headings below for ideas and tips on dealing with specific heifer grazing situations. This problem can happen in three different situations; when calves arrive at a grazier and have their first weighing (ie. calves that should have been 120-130kg are just over 100kg); during a grazing contract tenure a large portion of youngstock slip below target liveweight at a critical time or for subsequent weighings; or when stock arrive home from grazing when a weight gain contract or regular monitoring process has not been used. If not already done - weigh stock and compare with targets. Do you have any concerns with the size/weight or weight gain of this group of stock? How do you think they will achieve their liveweight target at ___ months? What challenges for liveweight gain has there been for this group of stock? How do you currently assess whether the stock are on target? Refer to Farmfact 3-22 Estimating mature liveweight for groups of dairy heifers and Farmfact 3-21 Feed requirements for grazing dairy heifers. Sometimes expectations are not meet when receiving and paying invoices. Graziers may find discrepancies in the amount paid relative to the invoice, late payments being made or payments being withheld due to an unresolved dispute. Stock owners may receive unexpected invoices from a 3rd party for vet services, supplies, feed etc. Those on liveweight gain contracts may find that invoices from their grazier have excessive (unplanned) weight gain on a kg/lwt contract. Relevant details from grazing contract on price and payment terms. Have transactional history summary prepared (include how much and when). Have copies of invoices from third parties with details specified. Records of communication between those involved - monthly reports. What is your understanding on what needs to be paid and when? Have there been circumstances which have prevented you from paying your invoices in their entirety or on time? This invoice is different from what was specified in our contract – are we able to clarify why this has occurred? This payment surprised me because I was expecting ………..
Can we arrange a suitable payment plan? Agree, amend and re-sign grazing contract to reflect expectations. Prepare Responsibilities Checklist to determine lines of communication and responsibilities for engaging third parties. Discuss and prepare an Adverse Events planner. Use the Monthly Reporting Template to communicate potential changes in future invoices. The nature of farming brings exposure to adverse climatic events such as drought, flood, snow, lightning strike, etc. Herds are also exposed to potential disease outbreak (TB, Theileria), and animal health issues on crops and pastures (brassica toxicity, nitrate poisoning, ryegrass staggers). All of these events will have an impact on feed required, feeding infrastructure, animal health, growth targets and stock losses. Check adverse event plan document. Gather regional data about the event if climatic, or from the vet if herd specific. Find out the current state of the herd and any immediate animal welfare concerns. In the event of a med/long term climatic event assess the potential impact on stock achieving liveweight targets. Calculate feed requirements and options to achieve this. If stock losses have occurred refer to your grazing contract for next steps. Are there any immediate animal welfare concerns that we need to deal with? What challenges will you have maintaining intakes to achieve liveweight targets? What will we need to do to achieve this? If an animal health issue – what on-going care will this group of stock need? Supporting info from DairyNZ website on adverse events. 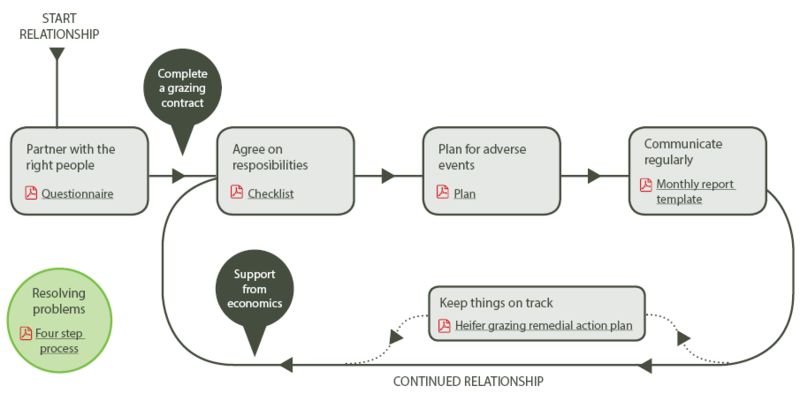 Use the Remedial action plan to commit to steps to get back on track. Farmfact 3-21 Feeding Requirements for grazing dairy heifers. Minimal stock losses are a part of farming but it is important that these are communicated in a timely manner and strategies are in place to prevent significant numbers of cattle deaths. Find out exactly what animals have died, when and what from. Were there any 3rd parties involved in this? If cause of death is unknown do we need to carryout autopsies? How are these stock being disposed of? What can we do to minimise the chance of this happening again? Create a remedial action plan if needed to prevent further loses of the same nature occurring. Livestock require constant monitoring, treatment and preventative animal health management carried out. Some individuals or mobs may suffer injury, ill-thrift (un-diagnosed), metabolic challenges, nutritional deficiencies, worm burden, TB reactors. If these are not identified quickly, remedied and prevention strategies carried out, then liveweight targets can be compromised. Refer to responsibilities checklist for who does what. Refer to grazing contract if you have included an animal health plan for the stock. Access info from monthly grazing reports on stock health issues and preventative treatment plans. Utilise weight data to show any trends where stock may be falling behind targets. Clarify what the expectations were of dealing with this particular animal health challenge. My understanding was that ………… (action) would be carried out by …………… (person). What was your understanding? How has this animal health challenge impacted on the liveweight targets for the mob? Are there any animals that require immediate attention? If so, what are your suggestions? Access information on stock health on the DairyNZ website. Use the remedial action plan to clearly detail steps to recovery for the mob or individual heifers. Use monthly reporting template to ensure good communication between both parties. Graziers are requested to carry-out the mating strategy for the R2yr heifers. Sometimes communication of expectations is not clear enough. Sometimes the execution of the strategy is not accurate enough. Monitoring and communication to adjust the plan is essential. Some challenges arise with queries at a visit to the stock about the bulls – supply, quality and quantity. This might include visual queries about size/ breed/health if they are supplied by the grazier. Most issues arise with the retrospective analysis of PD results, mis-matings (early/late, wrong bull), execution of bull ratio, implementation of PSM date. Refer to grazing contract and responsibilities checklist. Use Pregnancy Diagnosis results, Minda reports, InCalf tools, Veterinarian advise to clearly understand the challenge. What I have seen from the mob or gathered from the repro data is ………. What was your understanding of the mating strategy for this group of animals? How did you know whether these were on track? What corrective actions were taken during the mating period? Utilise InCalf info for heifer repro targets and vet advice to form a strategy. Engage 3rd party advice as specified in your adverse events plan or grazing contract. Carryout a remedial action plan if relevant for this season or adjust Grazing contract and Responsibilities Checklist for next season. If your grazing contract is based on weight gain the frequency, consistent method, timeliness, accuracy and missed weighings can be a source of disagreement. If data is being sent late or in an un-useable format this can cause frustrations. Refer to responsibilities checklist, monthly reports and grazing contract for evidence of expectations and practice being carried out. Clearly state why the weight data is important to the stock and how you use it. Find out what the challenges are specific to the grazier of meeting your expectations. As a grazier trying to work with a stock owner, clearly state what weighing process and time suits your system and infrastructure. Devise a procedure together that meets expectations. Refer to the Weighing Heifers factsheet on correct protocol on the DairyNZ website. Carryout monthly reporting using the DairyNZ template. Engage a third party to carryout weighing and reporting. In order to weigh or carrying out animal health treatments graziers require suitable yarding and race infrastructure to keep people safe and allow efficient work. Stock need to be safe and comfortable moving through lanes, in yards, paddocks and when in vet races and loading ramps. Challenges may arise when stock escape, are injured or when stock owners are challenged by the working environment. Animal welfare guidelines can be found on the DairyNZ website. Capture the relevant hazards you have identified while working/visiting the property. Record accidents or near misses to people while on the property. Record stock injuries caused by infrastructure issues. Share the risks/accidents and near misses you have identified to both stock and handlers. Discuss what mitigation strategies can be put in place - share strategies that have worked for you. Arrange to use mobile stock yards. Utilise the services of a 3rd party to manage stock handling, weighing, animal health treatments etc. When visiting youngstock you may come across evidence of substandard animal handling procedures including ill treatment, hard dogs, mob size (too big), broken tails, broken limbs/contusions/sprains, etc. As a grazier you may receive stock that appears fearful, difficult to yard and show physical evidence of abusive management. Both parties are obliged to address these issues. Take photos and record incidences. Agree on what a well handled animal should look like and how they should behave. Can you explain what happened to this animal/mob? I am worried about this animal/mob due to ………………………… (symptoms). Do you have an insights as to why this may have occurred? When animals are grazing off the dairy platform we rely on each other to ensure that animals are correctly identified at all times, and that NAIT requirements being meet, with the right animal in the right herd. Frustrations can arise when animals do not have their correct ID and when they are not in the right mob. Detailed list of every animal and their ID from the stock owner. Check tags during any yarding situation. Identify which stock have been incorrectly identified. Check notes in monthly report. Reiterate why traceability is so important. Ask which stock are missing tags, data and when they knew about this. What support do you require to get all stock correctly identified in my mob? Are there any challenges keeping stock in their correct mobs on your property? Demonstrate Minda data management and NAIT ID requirements. It can be difficult if both parties cannot agree on suitable liveweight targets for a mob of stock. This may also include targets at critical times and target liveweight gain/hd/day during set periods. Refer to targets set in grazing contract. Information on setting youngstock targets from Dairy NZ website (Farm fact 3-22). Provide info on herd liveweight BV, weight data from mature cows at 1st Dec and breed tables. Calf weight data before leaving the property. Explain why setting targets are important for the success of the stock. Ask what they feel is realistic under their system and what their biggest challenges to achieving this are. Outline a variety of methods to set targets - including pros and cons and discuss what best suits your grazing relationship. Sometime more or less stock than expected arrive in a mob. Individual financial situation may also require a negotiation around the tenure of the grazing period mid-season. All these situations make it hard to budget both feed and finances at a farm business level. Refer to dates and numbers specified in the grazing contract. Refer to historical numbers from the preceding years. If wanting to negotiate R2yr grazing through May and June be prepared to discuss required feeding levels for BCS gain and pregnancy. Be sure to discuss any Copper/B12/Se supplements that need to be administered, teatsealing, and Mg intake for early calving heifers. If wanting to bring R2yr home early due to feed shortage situation be prepared to reiterate the importance of achieving liveweight targets and the advantages of returning stock to the dairy platform to feed supplements. Share the impacts that changes in the number of stock grazing have on feed allocation and cash flow and ability to contract to other stock owners. Discuss when is a good time to provide an indication of how many calves will be reared as replacements - ie. Confirm grazing is required for R1yr’s in June. Update replacement numbers in September and approximately when they will arrive. Confirm grazing for R2yr's in Feb and update numbers (if being grazed elsewhere as R1yr's) in April. Heifers represent the future of your dairy herd. This section highlights some of the key aspects to rearing heifers from weaning through to first lactation.